Through its ever effervescent and expansive music catalogue, long-standing house imprint GOGO Music has been stretching its roots far and wide from its founding country, Germany. The label has offered a string of memorable dance-floor classics over the years, whether through its principal founder Ralf GUM or any of its enlisted and trusted producer and DJ talents Raw Artistic Soul, Joseph Junior, MAQman and Sir LSG who recently won the award for Best Producer at the Dance Music Awards in South Africa. From titles like Shana’s ‘Uyangichomela’, 60 Hertz Project’s ‘Capricorn’ or ‘Tapta Beach’ with Fast Vision Soul, Black Coffee’s ‘Garden of Eden/Trip To Lyon EP’ all the way to Sir LSG featuring Brian Themba and Kafele on ‘All I Am’ – GOGO has always had an ear-to-the-ground and it’s finger-on-the-pulse of the ever evolving local house music scene, presenting and profiling local producers who offer enigmatic gems that define an era. “I am very excited to present “The GOGO Music Industry Workshop” which will provide insights into the music business, tapping into the knowledge and experience of established musicians, managers and industry insiders. It gives up and coming musical talent the opportunity to engage with top industry representatives. 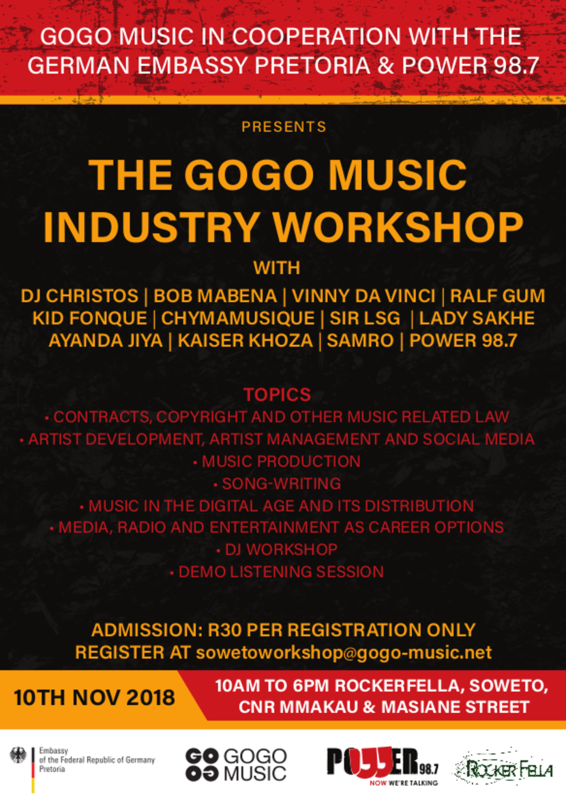 GOGO Music in cooperation with the Germany Embassy Pretoria & Power 98.7 proudly present The GOGO Music Industry Workshop which will provide insights into the music business, tapping into the knowledge and experience of established musicians, managers and industry insiders. It gives up and coming musical talent the opportunity to engage with top industry representative. 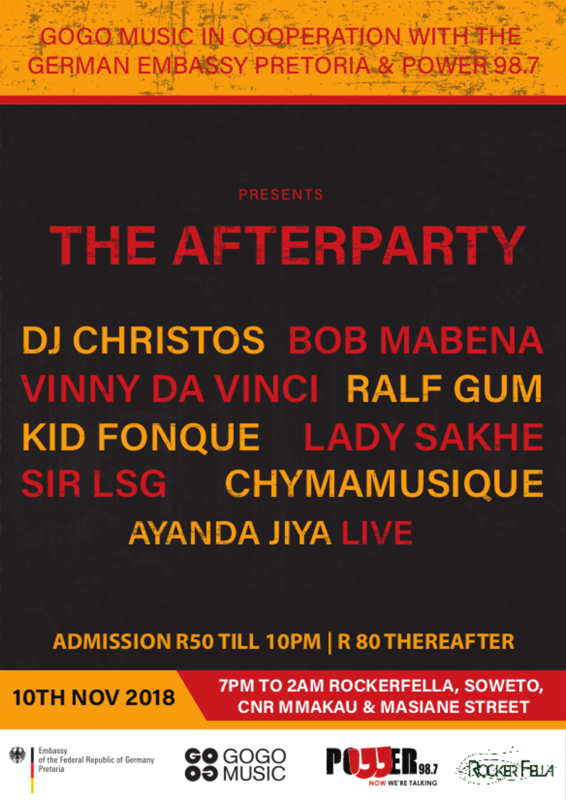 The Workshop will be preceded by an afterparty with Lady Sakhe, Kid Fonque, DJ Christos, Ralf GUM, Vinny Da Vinci, Bob Mabena, Chymamusique, Sir LSG and a live performance by Ayanda Jiya. CollaboratorsNote: We have it on good authority that there are very limited seats still available for the music business workshop, so we encourage you to book yours now to avoid disappointments. 10th of November 2018 Rockerfella, Soweto. Admission R30 per registration.